Cognac is a town in south western France. It is situated on the River Charente and lies between the major towns of Angouleme and Saintes and north of Bordeaux. The town is 400 kilometres southwest of Paris in the region of the Poitou-Charentes. The inhabitants of this town are referred to as Cognaçais. Unusual Historical facts: Christian pilgrims stayed in Cognac on the way to Santiago de Compostela in Spain. The town also changed sides on numerous occasions during the hundred years’ war. Development of Cognac: the French government provided Cognac with the right to trade salt along the river hence Cognac’s early commercial success. This was a factor that later facilitated the town’s development as a centre of wine and eventually the brandy known as Cognac. To be branded with the name cognac the drink is made as per strictly defined regulations. To appreciate the flavour of Cognac choose the classic Cognac glass shape or snifter. This is a type of glass used to serve cognac drink and often breaks with some classical convention of design. It is one of the many finest ways of serving cognac drinks. The use of cognac glasses to serve cognac drink dates back a century. It is a wonderful combination of function and pure pleasure. It enhances the intimate experience of drinking Cognac – appreciating the deep colour and liquid movement. By gently turning or swirling the glass the aroma is released. In general terms, brandy is a distilled spirit that is made from a fermented juice. Grapes are the most commonly used fruit in fermentation to produce brandy. However, some brandies are also based on fruits like apples, pears, and many other sweet fruits. Cognac is a special and more specific type of brandy. It is slightly more difficult to make cognac as compared to a brandy production. Differences between brandy and cognac: Only a wine brandy produced in cognac can actually be called cognac; cognac is considered to be more refined than a brandy. In terms of production, cognac is double distilled in a copper pot still. Brandy on the other hand, is distilled in alembic continuous still. In addition, cognac is always blended by an expert. Cognac vs Armagnac: Another special type of brandy is called Armagnac. Armagnac is less famous but claims to be equally good and undoubtedly has its dedicated fans. Although its production began hundreds of years before cognac, it has never achieved the same level of fame as cognac. This is due to the fact that its home area of Gascony suffered from poor river and sea connections making it more difficult for the English and the Dutch merchants. The golden rule of location is therefore one of the main differences between Cognac and the Armagnac brand. Armagnac can be blended but the unblended vintage Armagnac is very common. 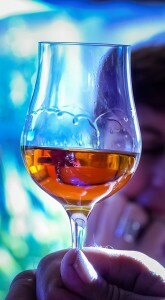 In terms of taste Cognac is most gentle and even subtle. A brandy such as Armagnac is always more complex and robust. Its alcohol content is higher. In reality, cognac has a 40% ABV while Armagnac has alcohol content between 46% to 485 ABV. There are plenty of rentals available in Cognac if you wish to explore the area. If you want to enjoy the slower style of life in Cognac then property in the town can be more expensive than the surrounding villages and rural locations. In these areas Charente property prices are below the national average. You will find elegant town houses and villas in Cognac. La Rochelle airport (with low cost airlines to London, Bristol and Ireland) can be reached in 70mins.